The Mid-Atlantic Fishery Management Council is responsible for management of fisheries in federal waters which occur predominantly off the mid-Atlantic coast. States with voting representation on the Council include New York, New Jersey, Pennsylvania, Delaware, Maryland, Virginia, and North Carolina. 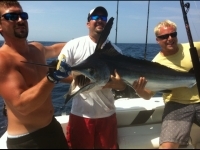 (North Carolina is represented on both the Mid-Atlantic and South Atlantic Fishery Management Councils.) The Mid-Atlantic Council appreciates your interest and encourages public input as we continue the process of managing and conserving our fisheries.